I have written a variety of series breaking down the key learnings that I observed with teachers, coaches, and administrators. Today I am going to selfishly reflect on my own takeaways from the recent leadership summit that occurred at the Dublin Unified School District. Our retreat occurred over a day and a half. It began early in the morning with a breakfast crafted to provide ample time for networking and check-ins with leaders that have been gone for the duration of summer. We were intentionally grouped at tables in non-job alikes. School site administrators sat amongst district administrators and department heads. There was a mixture of veteran and new leaders at every table. This approach set the tone for what we would experience over the course of the next and a half. Visiting with others in our district that we would generally not work with on a daily basis was a great opportunity to form and ignite relationships. Our new superintendent, Dr. Leslie Boozer, began the day by telling her personal story. It was an opportunity for everyone in the room to learn about Leslie and her background in a very meaningful manner. There is a lot of buzz in leadership right now about telling our story and encouraging principals especially to begin social media accounts to begin combating negative information that is in our news media and often on social media in our district. The personal story she told was not scripted nor did it feel disingenuous. She modeled what I will assume she would like each of us to do (especially for new leaders) in Dublin Unified. We rotated through concepts as a group and learned about elements of the district. A gallery walk with imagery/data graphs showing the history of Dublin Unified and our current academic and social/emotional climates in our schools. I am fortunate that I work with all departments on a regular basis in my role. Many of our staff do not get a chance to sit in Educational Services meetings learning about academic and other elements of “the work”. I heard many administrators share how grateful they were for that exposure. How do you move change through an organization? How do you deal with naysayers? How do you capitalize on anyone with any social influence to help spread your vision? Following the change board game, we were all invited to have an informal dinner together which allowed for more networking and debriefing from the day. Our next day began with a dynamic presenter on the topic of cultural relevance. It is a topic that many of the administrators in the district were hungry for. As we debriefed this element of the day as a team, it became a fast highlight for many administrators. Now we know we have begun the conversation. More on this topic as that story unfolds. The above was in a folder at every table for administrators. I want to emphasize no one ever was asked to pull out this new org chart, nor was any mention made that it was even in the packet. This very subtle way of introducing a very powerful new org chart to our organization was much appreciated. 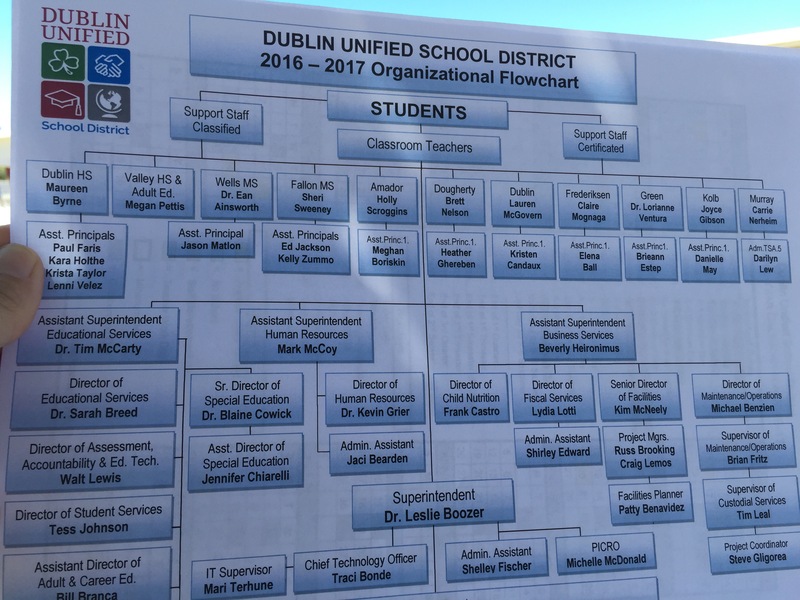 And the fact that Leslie put students at the top of this org chart tells me how important the work this year is going to be as we lay the framework with a new era of leadership in a high-performing district. I personally am very excited about what’s next on the horizon. We have an incredible group of leaders in Dublin Unified. I feel very grateful to be a member of this team.